This red taqueria salsa is absolutely delicious on steak or pork carnitas tacos. You need only a few ingredients to make it at home, and it lasts several days in the fridge. 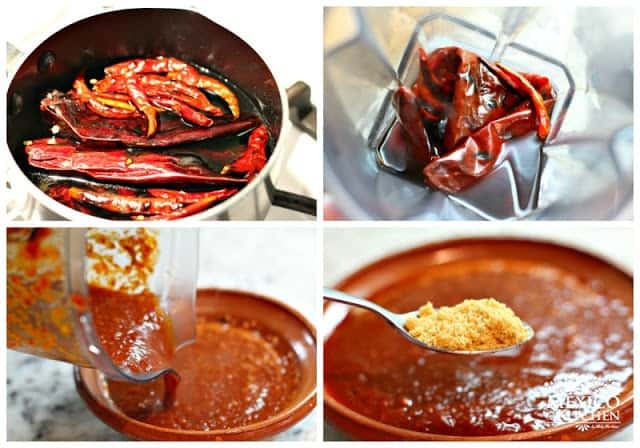 The roasted peppers give a robust flavor to the salsa and the addition of the granulated chicken bullion complements it very well. I’ve been hooked on it since the first time I tried it at my local taqueria, but it can also be used over your breakfast fried eggs or that fried chicken you love for dinner. If you love spicy salsas, like I do, this one is for you! One of the essential ingredients for a good taco is to have a good salsa. The types of salsas used for tacos changes from every region of the country due to the ingredients available, or to the type of meat used in the tacos. Some people love to have green salsa for their barbacoa (Stewed Beef) tacos, others must have a good tomatillo and avocado salsa for their carnitas tacos, and then there is the “Pico de Gallo” or Mexican salsa for the fish tacos. You can have endless conversations deciding which salsa is best for each type of dish, and maybe never agree on the same salsa. But one thing’s for sure, we love our tacos with a good salsa on them! Check this other Taqueria Style Salsa with roasted tomatillos and arbol peppers! 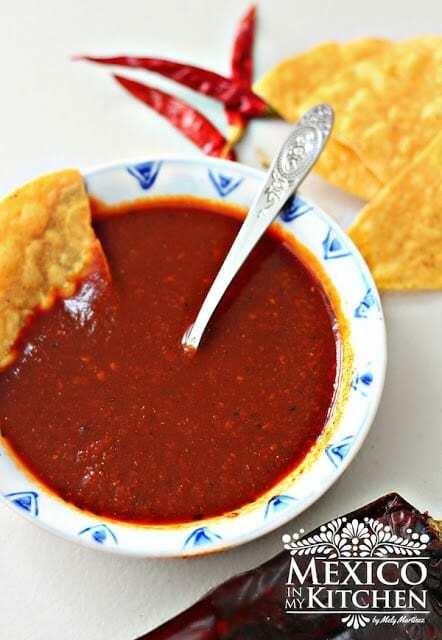 This is a spicy salsa, so to reduce the spiciness use fewer Arbol peppers. If you prefer not to use the granulated chicken bullion, make sure to adjust the salt to taste. Fill a saucepan with 4 cups of water, and set aside. Slightly roasted guajillo peppers and garlic cloves on a warm griddle. You can flatten the peppers to have an even roasting by gently pressing them down with a wooden spatula. Remove promptly to avoid burning the peppers. Place roasted peppers and peeled garlic cloves in the saucepan. Now, roast the arbol peppers. 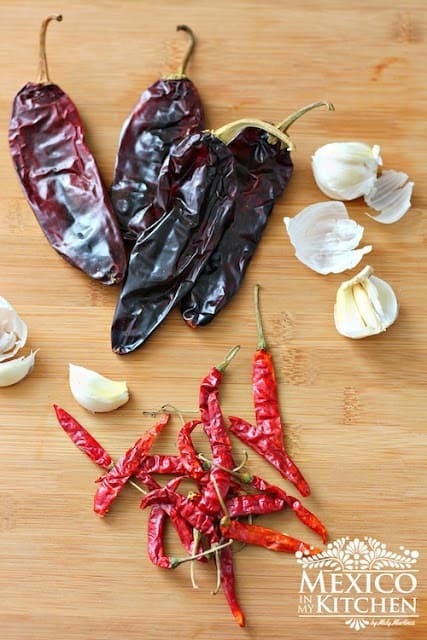 Arbol peppers will roast quite faster than guajillo peppers, that is why we’re roasting them separately. Once roasted, place them in the saucepan with the rest of the peppers. Turn heat to medium-high and turn off once the water starts boiling. Cover the saucepan and wait for 20 minutes. This soaking time will help to soften the peppers. Place peppers and garlic into your blender jar along with 1/2 cup of water. Discard any leftover soaking water. Process until you have a smooth sauce. Pour the sauce back in the saucepan, stir in the granulated chicken bouillon, taste to check if more salt is needed according to your own taste, and season with salt and pepper. Turn the heat to medium-high and cook for 5 minutes, just enough time to allow the chicken bouillon to dissolve and for the flavors to blend. This red taquería style salsa is absolutely delicious on steak or pork carnitas tacos. You need only a few ingredients to make it at home, and it lasts several days in the fridge. The roasted peppers give a robust flavor to the salsa and the addition of the granulated chicken bullion complements it well. 4 Guajillo Peppers cleaned, seeds removed, and deveined. 16 arbol peppers stems removed. 2 teaspoons granulated chicken bullion powder. Slightly roasted guajillo peppers and garlic cloves on a warm griddle (this step takes only seconds). You can flatten the peppers to have an even roasting by gently pressing them down with a wooden spatula. Remove promptly to avoid burning the peppers (burned peppers render a bitter taste). Place roasted peppers and peeled garlic cloves in the saucepan. 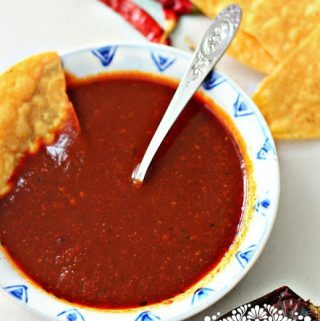 Receta en español Salsa Roja para tacos. Oh Yum!! Thank you so much for this recipe!! We get la lingua tacos at a taqueria in a near by town and they serve this type of salsa with them. Sometimes if we're lucky, we get some to go and I keep it in my freezer. Now I can make some thanks to you. I just need to go get some chili arbol.. Thanks so much! Blessings! Tengo que publicar salsas yo también! Is it supposed to be liquid? Mine came out very liquid, not at all thick. Thanks for the input. It shouldn't be too liquid. Beautiful!! Love Mexico in mykitchen, always the very best Mely!! I made this recipe. It was absolutely a crowd-pleaser however mine did it come out thin so my suggestion is to add the soaking liquid a half cup at a time until you get the correct consistency. Thank you Mely , it's delicous! Thank you for trying the recipe. I hope you recommendation helps other cooks. This salsa is amazingly good but mine came out so spicy it hurt lol. It there anyway I can fix it? Yes you can fix it. 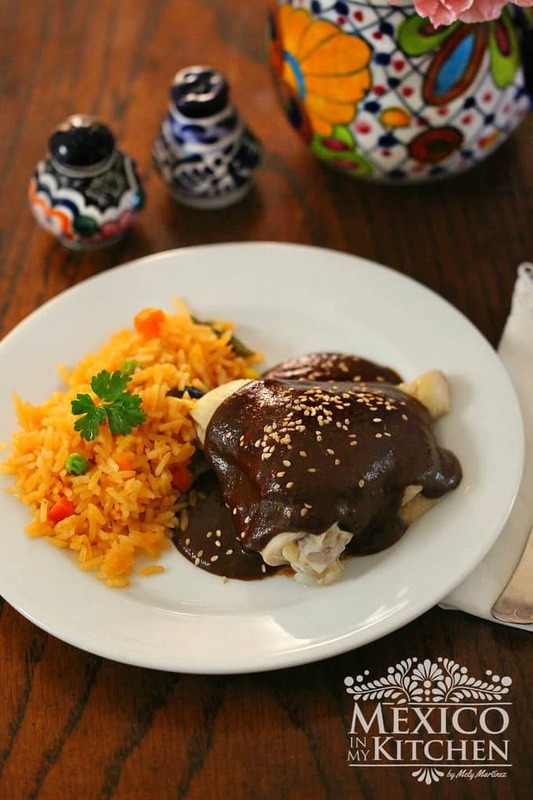 You will need to add more guajillos, repeat the same process that you did, roast, cook and then blend. Thank you for trying the recipe! A very nice salsa recipe though I found it too salty for my tastes. On my 2nd batch, I found that using 500ml liquid chicken stock with 500ml water as the soaking liquid in lieu of the bullion adds enough flavour, and it can be salted to taste at the end. That said, lazy me usually buys the La Costeña jars, but nothing beats the sauce made at home. That is a clever idea, some cooks in Mexico add the chicken stock too. And, yes, some brands of chicken bouillon can be salty. Happy cooking and enjoy your salsa! This is my go to salsa now thank you Mely! I absolutely love this, although this last time I doubled the batch and was disappointed because it just wasn’t spicy enough. Maybe the brand of Chile’s I bought this last time we’re just not as spicy. I’ll have to increase the peppers next time. Again thank you so much I love this recipe! For the other person who’s salsa came out too watery, I add little by little until I get the consistency I prefer. I also had that same issue the first time I made it as well. Hope that helps. Can I add flour to thicken sauce. You are welcome to add it and make it your own personal version. Well Mely I cooked up some pork which I sprinkled with flour as it cooked and added the salsa to it and let simmer. The outcome was delicious!! It was rich and thick like a mole. That is such a great idea. Look forward to trying it myself! I no sooner found this recipe and made it that afternoon. It transported us to a Mexican restaurant without leaving the house. I would recommend only 1/2 cup water in the final step. Thank you for sharing. Thank you for trying the recipe, I appreciate your suggestion about reducing the amount of water. I hope other readers find this tip helpful. Provecho! Can you use this sauce for tamale filling g? Yes, you can, it will be a little spicy. This sauce is perfect and a real crowd pleaser. We couldn’t put it down! Thank you for trying the recipe. Happy cooking!